Socialize Your English Cocker Spaniel Puppies We strongly believe that puppy socialization is very important in developing a dog you can live with. 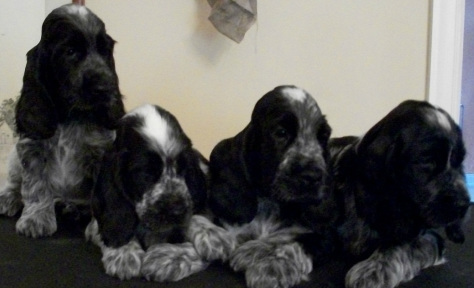 English Cockers are a merry, happy, outgoing breed by nature, but poor socialization can still develop a puppy who is afraid of strangers, aggressive towards other dogs or people, or many other serious behavior problems. Introduced him to the sounds of the vacuum cleaner, car engines and city traffic, children, men with beards, women in floppy hats, and senior citizens. He needs to be exposed to these now. His education and socialization should include exposure to many types of people of all ages and animals. Everything he experiences makes a greater impression on him now more than it ever will again. Learning at this age is permanent. Our puppies are raised in our home. From day one the puppies are held and exposed to different sounds and textures. From 2-4 weeks we concentrate on having the puppies around many different people, holding them in different ways, putting them on different types of bedding, and taking them out of the whelping box individually for cuddle time. They also spend lots of time with their dam, who we believe teaches puppies to be appropriate in behaviors with other dogs. If the weather is good, the puppies are allowed to play in an x-pen in the yard to get some sunshine and fresh air. We will put them in grass, shavings, puppy pads, etc to get puppies used to going potty on many different surfaces. This helps make traveling with your English Cocker so much more convenient. Our puppies are not housebroken at eight weeks and do not "get it." Their minds and bodies need to develop more. At about 9-10 weeks, we start taking puppies out to go potty in the yard after they wake up, finish playing, and after meals. At 6-8 weeks, we start separating puppies into crates for short periods of time to get them used to being alone and gradually transfer them to sleeping in crates alone at night. We allow some pet puppies to leave at eight weeks if they are emotionally mature enough, but other pet puppies need to wait until ten weeks before leaving for their new homes. Housebreaking your new English Cocker Spaniel is going to take patience. You should begin to housebreak as soon as you bring your new puppy home. Puppies need to relieve themselves approximately six times a day. A puppy should be taken out immediately after each meal since a full stomach puts pressure on the colon and bladder. A puppy is not physically able to control the muscle that allows him to "hold it" until he is about 12 weeks of age. Before this time, good housebreaking routines should be practiced to avoid having your puppy urinate and defecate all over your house. Watch for signs of urination or defecation, such as turning in circles. Take your puppy out often. Using a crate or confining your puppy to a small part of the house that has easy clean up floors are some ways to ensure your puppy does not urinate all over your house. It is much harder to housebreak a puppy if he smells urine in places you do not wish him to relief himself. If your puppy relieves himself on your floor and you show your disapproval five minutes after he has committed the act, the puppy will think that the mess on the floor is bad. He will not relate to the fact that it was the act of relieving himself on your floor that you disapprove of. The dog will eliminate, see the mess and get worried; you are now going to be unhappy. This is the reason so many dogs will relieve themselves in inappropriate places and look really guilty about it, yet they continue to do it. Dogs want to please, right? It knows the mess upsets you but does not understand that it should stop "making" the mess. To your dog, these two things: "the mess" and "the act"are unrelated. The trick is to catch your dog in the act and make him understand. You do not need to hit your dog. The tone of your voice is enough to make the dog see you are unhappy. A firm "No! You are not allowed to go in the house. No! No!" is all that is needed. Immediately take your dog outside to the appropriate place. Wait for your dog to go again and when and if he does, praise him. Before you crate train, please be aware: a dog that is left in a crate all day long, gets let out in the evening after work for a few hours and put back in the crate for the night can become neurotic, destructive, unhappy and noisy. If you work all day, it is recommend that you find someone who can take your dog out for a long walk in the afternoon. If this is not possible only use the crate at night. If you must leave your dog all day long every day and you have nobody to let the dog out during the day, you should find a room without a rug, put down Pooch Pads Reusable Housebreaking Pads, food, water and toys. You should set up the room so that the bed and food are at one end and the pee pads at the other. They need to find something to occupy their mind, so give your dog plenty of toys. It is said that dogs are den animals and like the crate, but even a den animal would go crazy if it was lock up all day long. You must be willing to invest time and energy for just a few short weeks in house training. The effort you put in now will last for the rest of your pet's life. The crate training method is as follows. Buy a crate and for the first 3 to 4 weeks keep your puppy in it when you are not with him. It should be large enough for the puppy's bed, but no larger. Dogs do not want to soil their bed and the use of a crate teaches them to control their urge to eliminate. Be patient and do not rush the little guy. He may have to go several times in one "pit stop." Give him about 10 minutes before taking him back inside. Do not play with him while you are on this mission. Let him know this is a business trip. Make sure you take him out after every meal and play session BEFORE you put him back in his crate. Be consistent and establish a schedule. Pay attention to your puppy's behavior so you can develop a schedule that works for you and the pup. Make sure everyone who is involved in the housebreaking process is using the same spot in the yard and the same word. Everyone should agree on the place they will take the puppy. The odor from the previous visits will cause the puppy to want to go in that spot. Use a simple word like "outside" when taking your puppy to the chosen spot. Use this word consistently and later this word will help build communication between the family and the dog. When you notice him going toward the door and you say "outside" he can say "Yup, that’s where I need to go,".